Base class for adjusting basic blocks during discovery. User-defined basic block callbacks are invoked as each instruction is discovered for a basic block. See Partitioner::discoverBasicBlock for details. One of the important uses for basic block callbacks is to adjust the control flow successors for a basic block. As each instruction of a basic block is discovered the partitioner calculates its control flow successors to decide what to do. The successors are calculated by evaluating the basic block instructions in a symbolic domain, and if that fails, by looking at the final instruction's concrete successors. Once these successors are obtained, the partitioner invokes user callbacks so that the user has a chance to make adjustments. By time this callback is invoked, the basic block's initial successors have been computed and cached in the basic block. That list can be obtained by invoking Partitioner::basicBlockSuccessors (or similar) or by accessing the BasicBlock::successors cache directly. Likewise, the successor list can be adjusted by invoking methods in the partitioner API or by modifying the cache directly. Another important use for these callbacks is to tell the partitioner when a basic block is finished. The partitioner has a fairly long list of criteria that it uses as documented in Partitioner::discoverBasicBlock. One of these criteria is to look at the args.results.termination enum returned by the callbacks: if it is TERMINATE_NOW or TERMINATE_PRIOR then the block is forcibly terminated regardless of what would have otherwise happened. The partitioner expects callbacks to have shared ownership (see Shared ownership) and references them only via Sawyer::SharedPointer. Therefore, subclasses should implement an instance class method that allocates a new object and returns a shared pointer. Definition at line 38 of file Modules.h. Shared-ownership pointer to a BasicBlockCallback. Definition at line 41 of file Modules.h. Whether to terminate a basic block. Do not explicitly terminate block here. Make current instruction the final instruction of the block. Make previous instruction the final instruction of the block. Definition at line 44 of file Modules.h. 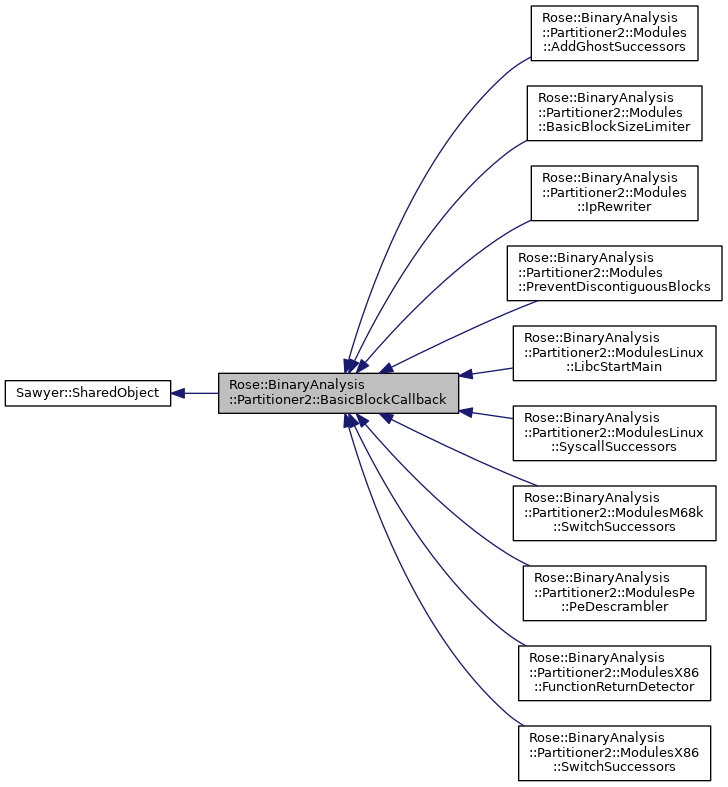 Implemented in Rose::BinaryAnalysis::Partitioner2::Modules::BasicBlockSizeLimiter, Rose::BinaryAnalysis::Partitioner2::Modules::PreventDiscontiguousBlocks, Rose::BinaryAnalysis::Partitioner2::Modules::AddGhostSuccessors, Rose::BinaryAnalysis::Partitioner2::ModulesPe::PeDescrambler, Rose::BinaryAnalysis::Partitioner2::ModulesX86::SwitchSuccessors, Rose::BinaryAnalysis::Partitioner2::ModulesX86::FunctionReturnDetector, Rose::BinaryAnalysis::Partitioner2::ModulesLinux::LibcStartMain, Rose::BinaryAnalysis::Partitioner2::ModulesM68k::SwitchSuccessors, and Rose::BinaryAnalysis::Partitioner2::ModulesLinux::SyscallSuccessors.